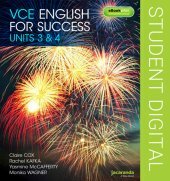 Key features of the VCE English for Success series includes detailed coverage of the Areas of Study, with an emphasis on metalanguage. 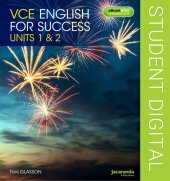 It enables students to build confidence in understanding the subject matter that forms the basis of the Study Design. It also includes sample responses to assessment tasks. Many of these are annotated and provide strong models for students to emulate, giving them a chance to improve their outcomes.